Still think voter ID laws won’t keep people from voting? Over 600,000 people in Texas may find themselves unable to cast ballots, thanks to the U.S. Supreme Court’s shamefully unjust decision to allow Texas to enact SB-15, the strictest voter ID law in the nation. The Huffington Post reminds us that Federal Judge Nelva Gonzalez Ramos struck down the Texas voter ID law, after receiving extensive data and testimony from experts and witnesses, as covered in her 147-page opinion for her Veasey v. Perry ruling. 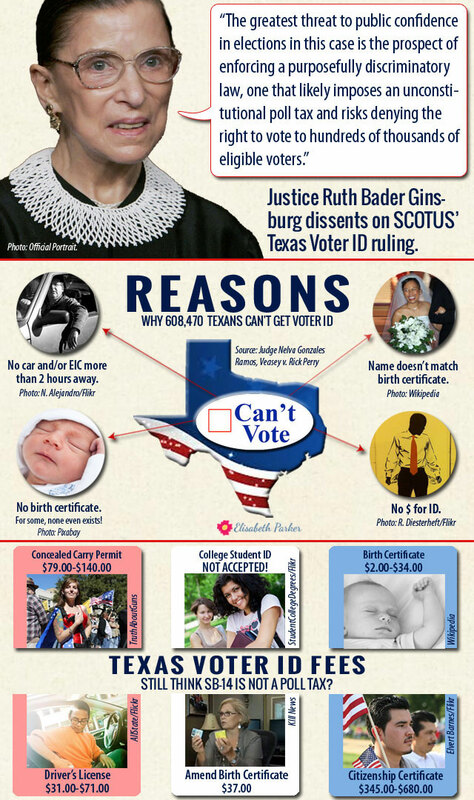 14 Texas voter ID facts. Liberals and people of color have long suspected that voter ID laws discriminate against seniors, women, people of color, college students, and other demographics that tend to skew poor and vote Democratic. Thanks to Veasey v. Perry, and Federal Judge Nelva Gonzalez Ramos’ report, we now have proof. In light of the facts presented, the U.S. Supreme Court’s ruling is unconscionable.Next time someone claims voter ID laws aren’t. 13. Texas has a long history of trying to keep people of color from voting. The state has been found in violation of the now-gutted Voting Rights Act in every redistricting cycle since 1970. 13. 14,025,441 Texans are currently registered to vote, according to the Texas Secretary of State. 12. 608,470 (4.5 percent) of registered voters lack qualifying SB 14 ID. 534,512 of these voters do not qualify for disability exemptions, that would allow them to mail in their ballots. 11. Low-income people often lack photo ID because they don’t drive, can’t afford alternative photo IDs, or don’t have the birth certificates required for getting SB-14 compliant voter IDs. 10. 2,064,330.18 Texans are seniors, some of whom lack the birth certificates required to get voter IDs because they’ve either lost them or never had one, because their mothers gave birth to them at home. 9. Even younger Texans sometimes lack birth certificates. An estimated 400,000 live in Colonias — remote, substandard rural housing developments — lacking in hospitals, roads, and other infrastructure. Mothers generally give birth at home with a midwife. 8. 21,731 registered voters appear on the “No-Match” list. They’re banned from voting because the names on their birth certificates do not match their current photo IDs. This often happens to women who change their names when they get married or divorced. Last year, Texas Judge Sandra Watts made headlines when she nearly got turned away from the polls because of this. 7. People of color are more likely to lack photo ID. Hispanic registered voters are 177 percent more likely and Black voters are 271percent more likely than Anglo voters to lack SB-14 compliant identification. 6. Birth certificates and EICs are cheap…If you’ve got transportation. Texans lacking ID can get birth certificates for only $2.00, and can then get Election Identification Certificates (EICs). Unfortunately, they have to go to the appropriate office in person. That’s a tall order for those who lack vehicles and/or have to travel great distances. 5. 737,000 citizens of voting age have to travel 90 minutes or more round trip to get the right ID. That’s how long it takes to get to and from their nearest Department of Public Safety (DPS) office, mobile EIC unit, or county office providing EICs. Going during office hours also may require losing a day’s paycheck. 4. For many, the travel time’s even worse. 596,000 citizens of voting age must travel at least two hours, and over 418,000 face commutes of three hours or more to get to a DPS, mobile EIC unit, or country office. 3. People without cars are often the ones who live farthest away. Of those who don’t have cars, 87.6 percent face these ridiculously long travel times to get voter identification. 2. All this for just two voter fraud cases. From 2002-2011, only two people were convicted of voter fraud. How is that worth depriving 600,000 people of the right to vote? Next time someone claims voter ID laws aren’t discriminatory and don’t keep people from voting, save the image below to your computer so you can show it to them. Featured image: Official photo via Wikimedia Commons.